The 2015 Chevrolet Cruze and Volkswagen Jetta are two of the most popular compact cars on the market. Drivers shopping this segment are typically looking for fuel-efficient engines and top-notch features. Read our side-by-side comparison to see which model is right for you. The 2015 Chevy Cruze is our pick in this category, thanks to its cutting-edge technology. This year, Chevrolet is the first manufacturer to outfit its entire lineup with a 4G LTE wireless connection. This standard equipment turns the Cruze into a mobile hotspot, allowing drivers to stay connected on the go. The Cruze also comes with Bluetooth phone connectivity to help drivers keep their eyes on the road. Beginning with the midrange Eco model, the Cruze is equipped with Chevrolet's MyLink infotainment technology, accessible via a 7-inch color touchscreen. Although Volkswagen has yet to offer anything remotely like the Cruze's Wi-Fi capabilities, the 2015 Volkswagen Jetta comes standard with some high-tech features. Bluetooth technology lets users access their devices' phone and music streaming capabilities via the stereo. The 2015 Chevrolet Cruze is our pick in this category, thanks to its smooth ride and fuel-efficient engines. The base LS Cruze comes with a 1.8-liter four-cylinder engine. Its six-speed manual transmission is standard, but a six-speed automatic transmission is optional. The 1LT, Eco, and LTZ come standard with a 1.4-liter turbocharged four-cylinder engine that makes 138 horsepower. On the highway, the Cruze Eco model can achieve up to 42 mpg. An available diesel engine achieves an impressive 46 mpg on the highway. The 2015 Volkswagen Jetta's base engine is a 2.0-liter four-cylinder that makes only 115 horses and 125 pound-feet of torque. It achieves up to 34 mpg on the highway. Stepping up to the SE and SEL models, however, will get drivers a 1.8-liter turbocharged four-cylinder that improves performance with 170 horses and 184 pound-feet of torque. Jetta TDI models get the line's turbocharged 2.0-liter four-cylinder diesel engine, which now makes 150 horsepower and 236 pound-feet of torque. It may be a compact car, but the 2015 Chevy Cruze is big on space. Passengers can count on adequate head- and legroom and a comfortable trip. In back, drivers have access to ample cargo space for groceries and sports equipment. The 2015 Jetta offers a neat, minimalistic cabin. However, compared to the Cruze, it seems a little behind the times. It lacks the Cruze's edgy look and technology-focused dash. The 2015 Jetta is our pick in this category. After government crash tests, it scored a perfect five stars for overall protection. It comes standard with traction and stability control, antilock disc brakes, and an array of airbags. Like many larger and more luxurious vehicles, Jetta models can be equipped with high-tech driver vigilance systems, including rear-traffic alert, forward-collision warning, and blind-spot monitoring. The 2015 Chevy Cruze comes with an impressive lineup of standard safety equipment. Four-wheel antilock brakes and traction and stability control guard against accidents. OnStar technology helps drivers out of unexpected situations with features like emergency notification and stolen vehicle tracking. The 2015 Chevrolet Cruze has the edge over the 2015 Volkswagen Jetta. Inside, passengers can expect a roomy cabin. A wide array of infotainment features keeps everyone busy and informed during long commutes. 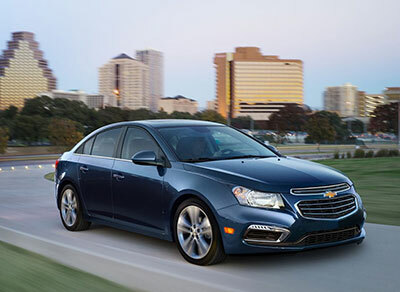 On the road, the Cruze's powertrains are smooth and fuel-efficient. Its safety equipment helps maintain driver and passenger safety.